A 3,000 kJ Rockfall Barrier System was set in place for protecting an area of Utah’s First National Park. 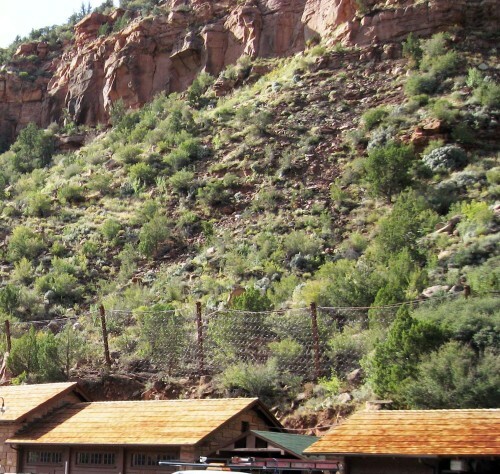 One early morning in February 2011, falling rock from a hill over the Maintenance Building at the Zion National Park damaged the wall roof and wall. Besides the building damage, the rock destroyed a sign-making machine valued at $35,000. Luckily, the park employees had not yet arrived, so there were no injuries. Having seen the potential for a major disaster, the National Park Service decided to solicit the install and design of a rockfall barrier system to protect the building from future rockfall events. After a thorough review of the site conditions, gathering on-site measurements, and a having a detailed design rockfall analysis completed, Maccaferri proposed a 3,000 kJ Rockfall Barrier System. This structure would provide protection from future rockfall events. The barrier was very easy to install and was a cost effective option. In addition to the safety aspects, it was painted with a powder coating to blend with the natural surroundings, making it aesthetically appealing. The Maccaferri rockfall barrier system was manufactured in California and transported to the location via a flatbed tractor-trailer. Rock Solid Solutions, an experienced contractor from Colorado, was selected to perform the installation of the system. One limitation of the project was that vegetation could not be removed because it was part of the National Park area. The total installation took only six weeks. The first week was utilized for mobilization and soil testing. The following two weeks were dedicated to cleaning and preparing the job site, constructing the post foundations, and installing the anchors. The last three weeks were spent assembling and installing the barrier. The project utilized 180 workable hours per week, averaging 6 to 8 hours of labor time per day. The installation was completed shortly before the arrival of winter, when the freeze and thaw effect on the rock produces potential rockfall events. Since the installation of the barrier system in 2011, there have been other rockfall incidents at Zion National Park. To learn more about Maccaferri’s rockfall protection applications, please do not hesitate to contact us.